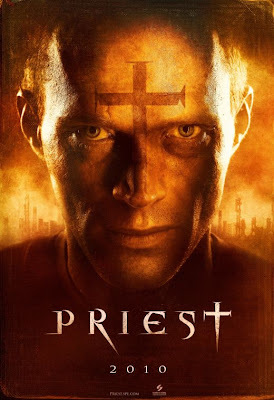 Michele Hauf posted the trailer for the forthcoming vampire movie Priest over at VampChix today. A futuristic vampire flick based on a graphic novel with a terrific cast including Paul Bettany, Karl Urban, Stephen Moyer (True Blood), Christopher Plummer and Brad Dourif. The film releases May 13, 2011. Looks like my kind of picture. I thought that looked like Paul Bettany. It sounds cool, but I'm getting cagey about pre-release hype. I was looking forward to "The Last Airbender," and it was universally bombed. Then I looked forward to "Jonah Hex," and supposedly it blows too. I even thought "The Sorcerer's Apprentice" might be fun, but it's lame too! I will say that "Inception" rocked my world last weekend. I loved that one, and it's a great sci-fi flick that doesn't involve space, aliens, or some post-apocalyptic setting. It's wholly unique. Rebecca the Hollywood machine has refined trailer creation to an exact science making even the most terrible movie look terrific. I didn't expect LAst Airbender to be good given M. Night Shyamalan recent track record. I saw Sorceror's Apprentice last weekend and it was a good Saturday popcorn movie. Would I rave about it and tell my friends it's a must see? No. But it is what it is and I had fun. Critics panned it but tough on them. I suspect Jonah Hex will be fun and the critics will hate it too or already do. I'm planning to see Inception this week or weekend and it looks terrific. True, Shyamalan has been riding the wave generated by "The Sixth Sense" for far too long now. I think "The Last Airbender" was probably the last straw for a lot of fans. Here in the U.S. "Jonah Hex" has been pilloried by critics and fan reviews alike. I don't even know of anyone who has gone to see it. Oh yuck. Not my type of movie. My husband might like it though. Paul Bettany is a favorite of mine, I've seen him scary, funny, and romantic (and naked in a Knight's Tale, lol). I hope we're in for a good one here, we due! I want to see Inception and Sorcerer, but haven't had the time yet. Ladytink. I guess we'll need a guys night out. Dottie I hear Inception is the movie to see. At least there are a few unabashed popcorn movies to see this summer.